The year 1979 may very well have been the year when the middle-class in America had first began it's long decent into oblivion. According to a U.S. Bureau of Labor Statistics report, manufacturing in the U.S. peaked in 1979 when we had over 19.6 million manufacturing jobs in a labor force of 104.6 million. 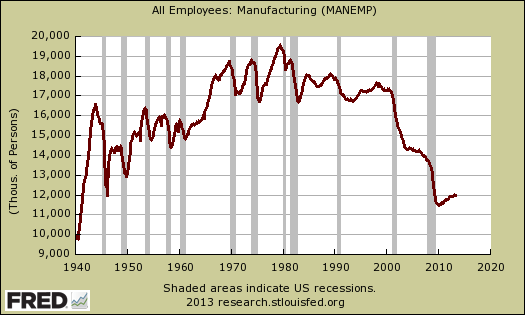 In 1979 manufacturing was 21.6% of all jobs. 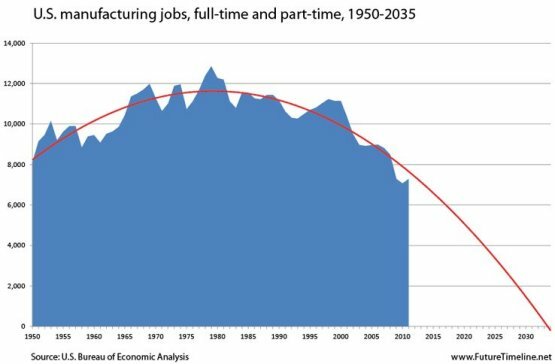 Now manufacturing is only 9,9% of jobs in America. Today we have 155.8 million in the labor force with 11.8 million workers unemployed. That's because manufacturing has left our shores, and it has been on a downward trend ever since --- with no end in sight. The year 1979 was also when mergers among the labor organizations began increasing --- when the total number of union members had peaked at over 22 million. This is also the year when the U.S. broke off formal diplomatic relations with Taiwan and established full diplomatic relations with China. There is no coincidence here. All roads lead to China. Lewis Franklin Powell Jr. wrote his famous "manifesto" on August 23, 1971 just before he was nominated by President Nixon to sit on U.S. Supreme Court. Less than two years later on March 29, 1973 Master Sgt. Max Beilke was officially designated the last American combat soldier to leave Vietnam. Soon afterwards major U.S. companies initially responded to "heightened competition" from Japanese and European multinational corporations by opening factories abroad during the 1970s (which may have involved using the Laogai labor camps in China). The American multinationals manufactured goods that were formerly produced by comparatively well paid, often unionized, factory workers in the U.S. According to one technical publication, A Brief History of Outsourcing, the current stage in the evolution of outsourcing is in the development of "strategic partnerships", which was first pioneered by Eastman Kodak with their decision to outsource their information technology systems in 1989. In 1999 Bill Clinton signed the controversial trade agreement with the People's Republic of China. The trade agreement was the result of more than a decade of negotiations, and lowered many trade barriers between the two countries. It's unclear how many jobs were offshored between 1979 and 2001, but data shows there were 398,887 private manufacturing establishments of all sizes in the United States during the first quarter of 2001, and by the end of 2010, the number had declined to 342,647 --- a loss of 56,190 factories. So the onslaught has continued for the past 35 years. And as Robert Oak at the Economic Populist pointed out, according to a study by the Economic Policy Institute, over the last decade (from 2001 to 2011) the United States has lost 2.7 million jobs to China alone (and this is a conservative estimate). The China PNTR trade agreement was signed by President Clinton on October 10th, 2000 and China entered the WTO in 2001. Since then our massive trade deficit has skyrocketed, stunting our economic growth and costing America millions of jobs. And that doesn't even include the multiplier effect (when one job generates another job that is dependent on that job). A study by University of Illinois at Chicago concluded that one manufacturing job in the Windy City leads to 2 more. And on a national scale, the multiplier for a manufacturing job is 4.6 --- higher because of a larger geographic scope for supply chains and induced spending. So those 2.7 million jobs lost to China over just those ten years alone could theoretically equate to 4 or 6 million more. "Of the people who lost their jobs through offshore outsourcing, plant closures, business failures and layoffs during 2009-2011, by January 2012 only 56% of them had gotten another job. These are people who held the job they lost for three years or longer, and there were a whopping 6.12 million of those people in this category. In an updated BEA summary on sales, investment and employment by Multinational Corporations for 2011, we have a 0.1% increase in hiring for jobs in the United States while MNCs increased their hiring abroad by 4.4%. From 1989 to 2011, U.S. MNCs decreased their employment in the United States by 3.3 million workers while expanding employment abroad by 6.5 million employees. The share of employment by MNCs in the United States went from 79% of their total employees in 1989 to 66.3% by 2011. Multinational corporations are clearly doing their hiring abroad." "During the recent great recession since 2007, many observers wrote the American Manufacturing Obituary, claiming that American could no longer be regarded to be a world leader because of intense competition from low-cost competitors. Trade liberalization has increased the economic interdependence among nations. Multinational corporations in the U.S. have established operations in developing counties where labor is cheaper. One consequence of this increased globalization of manufacturing industry has been movement of jobs and production from the U.S. to Low Labor Cost (LLC) countries (which are often less developed countries) for higher corporate profits. This practice is called offshoring, and is a direct consequence of Monopoly Capitalism, where the prime motive is corporate profits without consideration of job losses for people in the home regions. Globalization works to the detriment of American workers and reinforces unfair labor competition because of lower wages and inadequate working conditions existing in developing nations." "Contrary to conventional wisdom, the more offshorable occupations are not low-end jobs, whether measured by wages or by education. The correlation between skill and offshorability is almost zero." His conclusion supports the research of a December 17, 2012 Congressional report on offshoring. Alan Blinder was quoted on page 10 as saying a moderate estimate of 25.6% of all U.S. jobs are most susceptible to offshoring --- and his more aggressive estimate totals almost 40 million, or 29.0% of all U.S. jobs. A Washington Post article notes that many people believe that Boeing's troubles with its 787 Dreamliner jets is because of outsourcing. Critics have long charged that Boeing was far too reliant on offshore suppliers for the 787′s production. More than 30 percent of the jetliner's components came from overseas. Total jobs losses were just under 8.8 million, over a period during which we should have added about 3.1 million more, creating a cumulative job deficit of about 12 million by February 2010. Then the job deficit rose even higher in 2010-11 as job creation fell short of the 125,000/month required to keep up with population growth. By August 2012 total employment was only back to April 2005 levels --- for a zero net growth over a period exceeding seven years. In an average month during 1948-2007, less than 13% of the unemployed were jobless for over 6 months; by April 2010, it was over 45% --- and is only slightly less today. From Nike's website: "When we look at our overall impact on the world, the needs of nearly one million workers in Nike's contract supply chain overshadows any other group." And Nike is but one of many examples (albeit, a very classic example) of globalization. It's a pity that those one million workers in Nike's supply chain are in Asia, not America. On May 12, 1998 Nike's CEO Phil Knight gave a speech at the National Press Club where he spoke of Nike's reasons for moving factories out of the United States and into mainly third world countries in Asia. "During the 1990s, all our experiences have caused us to really believe in the benefits of international trade. The uplifting of impoverished people, the better values for consumers in industrialized nations, and most of all, the increased understandings between peoples of different cultures." "The U.S.-based CEO of one of the world's largest hedge funds told me that his firm's investment committee often discusses the question of who wins and who loses in today's economy. In a recent internal debate, he said, one of his senior colleagues had argued that the hollowing-out of the American middle class didn't really matter. His point was that if the transformation of the world economy lifts four people in China and India out of poverty and into the middle class, and meanwhile means one American drops out of the middle class, that's not such a bad trade." But then again, are they really so concerned about lifting the poor out of poverty in third world nations, or is it just a simple matter of plain old fashion greed, and they are just using these humanitarian excuses (as a public relations matter) as a cause for their actions? Since the 1990's many major U.S. companies have been criticized for offshoring jobs. Businesses in the manufacturing, tech and apparel industries, such as Apple and Nike (to name just a very few) have often been targeted for using cheap labor in very unsafe and slave-like working conditions abroad. "For years--even decades--in response to intensifying global competition, companies decided to outsource their manufacturing operations in order to reduce costs. But we are now seeing the alarming long-term effect of those choices. In many cases, once manufacturing capabilities go away, so does much of the ability to also innovate and compete. Manufacturing, it turns out, really matters in an innovation-driven economy. Companies must reinvest in new product and process development in the US industrial sector. Only by reviving this 'industrial commons' can the world's largest economy build the expertise and manufacturing muscle to regain competitive advantage." The classic example here is Apple: most of the value of an iPhone or iPad comes from the design, software, branding and retailing, not from the assembly. Therefore, U.S.-headquartered Apple can become the most valuable company in the world, even while making virtually nothing in the United States." The World Trade Organization cites a report from 2000 by the U.S. Department of Labor (Displaced Workers Survey) that used data from 1975 to 1995. It found that rates of job losses were particularly high in sectors with high levels of imports and sectors with high import growth. The Bureau of Statistics Displaced Workers Summary from August 24, 2012 reports there were a total of 12.9 million displaced workers from 2009 to 2011. The prior survey, which covered 2007 to 2009, numbered 15.4 million. The previous survey reflected the steep decline in jobs associated with the Great Recession that began in December 2007 and officially ended in June 2009. According to the Center on Budget and Policy Priorities, 8.7 million net jobs were actually lost during the last recession. Prior to the last recession, there appeared to be enough job growth to compensate for most of the lost jobs due to offshoring, although, many Americans were forced into taking lower paying jobs (such as in the retail and fast food industries) and most often without any benefits (such as healthcare and pension plans). And many times they only found part-time or temporary positions, which set them on a never-ending course of "job hopping". But since the recession, long-term unemployment has been a huge drag on the economy --- and according to the Bureau of Labor Statistics, with 11.8 million unemployed Americans, and 8.2 million working part-time, and another 7 million working multiple jobs to make ends meets, all those millions of offshored jobs are looking even more appetizing. Since the Great Recession major attention has again returned to the subject of offshoring (some are now saying "reshoring") --- and in conjunction to the Occupy Wall Street movement, an ever increasing focus has also been on wealth inequality, income disparity, corporate greed, CEO pay, stagnate wages and the minimum wage. And then it all comes back again full circle --- back to offshoring for cheap labor. Meanwhile, corporate cash is once again at a record high. According to a report by the research firm Audit Analytics, large U.S. companies have boosted their offshore earnings by 15 percent last year --- to a record $1.9 trillion, while avoiding hefty tax bills by keeping their profits abroad (rather than invest in American workers). Their overseas earnings stockpile has climbed by 70 percent over the past five years, but most American workers aren't sharing in the corporate booty. Millions are either under- or unemployed. Now 50% of the work force who are working take home $27,000 a year or less. And instead of seeing a pay increase, they saw the biggest drop in hourly pay on record. It seems workers haven't been reaping the same rewards as their employers --- when "worker productivity" once meant something to the workers too. The Heritage Foundation thinks workers must be more productive. No...Nike is NOT an American Icon, but it is a typical a job creator...overseas. Wall Street Journal (June 27, 2013) Nike's profits are up again --- their fourth-quarter profits jumped 22%. Nike also expects overall profits for fiscal 2014 to rise in the low double-digits as sales are expected to climb, helped as Nike gears up for the 2014 World Cup in Brazil. Margins are expected to strengthen throughout the year, helped by higher selling prices. Demand for athletic gear in the U.S. has also been strong in recent years, and Nike's sales have been bolstered by apparel tied to a contract with the National Football League. "Nike's grand strategy for reaping in huge profits every year is really quite simple: just don't pay workers. That's how they sell a shoe for $180 that only costs just $5 to manufacture." The people who are laboring to make that $180 pair of shoes, and other Nike gear and apparel, are mostly young women, ages 16-24 (Although, in Pakistan, children were once sewing Nike soccer balls for $0.60 a day.) In Vietnam the average worker is paid about $0.20 an hour, or $1.60 a day. (While the cost of eating is reportedly $2.10 a day). And workers in Vietnam are forced to work 65 hours a week. Not only are they forced into overtime without compensation, the 65 hour work week is in clear violation of Vietnamese labor laws. In the Sam Yang factory in Vietnam there is only one doctor who works two hours a day to service 6,000 workers. Employees in Vietnam have stated that verbal abuse and sexual harassment are frequent and that corporal punishment is often used. Supervisors have been reported to frequently grab the women's breasts and buttocks. Nike has reportedly responded to many of these allegations by widely publishing their Code of Conduct in the factories --- but in Vietnam, few workers have even heard of such a code, nor ever learned what provisions were within it. As with many other major corporations, the Vanguard Group is the largest institutional investor of Nike --- followed by many other banks and private equity firms. Although Nike argues that they enter a country only when it is ready to make shoes, and then leaves when it has developed past this point, the data suggest a different story. Nike's movement directly correlates with a increased standard of living and increased union bargaining power. When the pressure for wage increase is put on, just like with most other American-based multi-national manufactures, Nike moves on. And Nike is just but ONE of many U.S. corporations that operate like this. That's how they can afford to pay their CEOs too much. Here's a list of the top paid CEOs from Forbes and what they earn in just ONE year --- many of them on the back of cheap and exploited foreign labor, at the expense of the American worker. In a letter from Rep. Mark Pocan and others to Rep. Sander Levin expressing concern about the TPP and Fast Track Authority. "As the economy continues to recover from the greatest financial crisis since the Great Depression , we can all agree that we cannot afford to have American production and American jobs sent offshore because of unfair trade agreements that undermine our economic growth. When jobs and production factories are offshored, American wages are lost, American-made products decline, and our international interests are compromised." "In the period after World War II, a growing middle class was the engine of our prosperity...But over time that engine began to stall, and a lot of folks here saw it...Global competition sends a lot of jobs overseas. It became harder for unions to fight for the middle class...And so what happened was that the link between higher productivity and people's wages and salaries was broken...So the income of the top 1percent nearly quadrupled from 1979 to 2007, but the typical family's incomes barely budged." So then WHY is Obama planning on extending "free trade" with the TPP trade agreement? Last year's congressional study on offshoring says 29% of U.S. jobs are prone to outsourcing --- and then we can also add in all the new guestworker and H-1B visas with the new immigration bill, flooding an already over-saturated labor market --- then on top of that, we can also add over 4 million long-termed unemployed (and the 99ers) that we already have, and there will be plenty of shoe-shine jobs available for a nickel a shine. Bring jobs back to America and pay workers a "living wage"...no excuses, Just Do It! ► Play ▌▌ Pause ■ Stop Offshoring Jobs! A labor rights group Monday accused a Chinese company that makes iPhones for Apple Inc. of abuses including withholding employees' pay and excessive working hours. China Labor Watch said it found violations of the law and of Apple's pledges about working conditions at factories operated by Pegatron Corp., a Taiwanese company. TPP is soon be in a town or city near you. Many people know that NAFTA has already cost U.S. workers 700,000 jobs. Now Congress will soon debate whether to “fast-track” a trade deal that would make job-killers like NAFTA look puny. The Trans-Pacific Partnership would give corporations the right to sue national governments if they passed any law, regulation, or court ruling interfering with a corporation’s “expected future profits.” They could also sue over local or state laws they didn’t like. The TPP would cover 40 percent of the world’s economy. Existing laws and regulations on food safety, environmental protection, drug prices, local contracting, and internet freedom would all be up for challenge. And the decision-makers on such suits WOULD NOT be local judges and juries; they’d be affiliated with the World Bank, an institution dedicated to corporate interests. increase in corporate profit rates, but rather an increase in the share of income paid for the use of structures and equipment... if globalization continues apace, the labor share will most likely continue to decline, especially in sectors that face the largest increases in foreign competition...the most recent decline has been dominated by changes in the trade and manufacturing sectors, even prior to 1980...there is limited evidence that the share is dropping due to the substitution of capital for (unskilled) labor to exploit technical change embodied in new capital goods...the Affordable Care Act is also likely to drive movements in the near future. “Since health insurance benefits are part of payroll compensation, a change in the prevalence of these benefits that is not offset by changes in wages and salaries will affect the labor share." "Our analysis identifies offshoring of the labor-intensive part of the U.S supply chain as a leading potential explanation for the decline in the labor share." Blows my mind that they needed an economic study by a think tank to determine this. Being a newly minted engineer in 1994, at my first job at a company in the formerly industrious state of Connecticut, I watched in 1995 as they dismantled the entire assembly department and sent all the jobs to Mexico, I witnessed management break the union, I watched management sack a general manager and install a new one who stated his goal was to turnover 30% of the salaried workforce (easily achieved). At the time of this writing, the factory building I started my first job after college has been knocked down and the small number of US sales and engineering workers moved to a small office space. ALL the commercial assembly and the bulk of the design engineering is now in china. Do you think I had a bit of buyers remorse in getting the college degree in engineering? I didn't need a study to tell me things didn't look to good. This had a tremendous impact on how I lived my personal life, from having children to buying a home. To me, the only unencumbered totally FREE market in the US is the labor market. There are no protections or bargaining power left for those of us who sell our time for money to live on. I agree, there are millions of Americans who have witnessed labor arbitrage and offshore outsourcing, if they were not a victim themselves. The evidence is overwhelming, yet somehow, we need studies to state it over and over again while this government is in partnership with corporate America to destroy working America. A short clip (15 minutes) at YouTube on China hosted by Ted Koppel called “The People's Republic of Capitalism”. The common complaint that the Chinese are taking jobs away from American workers is in many cases true. China has lifted 300 million people out of poverty in less than a generation That's a population, pretty much the size of the United States. The name of the game now is to bring the remaining billion out of poverty and they are going to be our competitors for oil and water. We don't care about China because the U.S. is just giving U.S. prosperity to China. We care about our kids, how our people are now INTO poverty and have no future, opportunity. Giving our jobs and economy away to another country so now Americans are screwed is simply not the answer. That sure ain't raising "all boats". Today, the Department of Labor issued a report declaring Vietnam as one of just four countries in the world that uses both child labor and forced labor in the apparel sector. Through the use of such unethical labor practices, in addition to union repression and abysmal wages, Vietnam has been able to keep its production costs low. Under the TPP, U.S. businesses and workers would be forced to directly compete with Vietnamese firms on this uneven playing field. On May 12, 1998 Nike's CEO Phil Knight gave a speech at the National Press Club where he spoke of Nike’s reasons for moving factories out of the United States and into mainly third world countries in Asia. Nike has 777 factories in 43 Countries employing 1,009,496 workers. Just in Vietnam alone Nike has 71 factories with 311,548 workers.